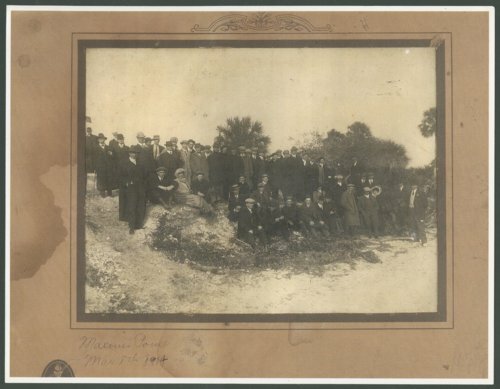 This group photograph was taken at Maximo Point near St. Petersburg, Florida in March 1914 and includes members of the St. Louis Browns baseball team. The team was in St. Petersburg for spring training. Individuals in the photo are not identified, but two Kansans were on the Browns team in 1914--Wiley Taylor, a right-handed pitcher from Louisville, Kansas and Earl Hamilton, a left-handed pitcher from Oswego, Kansas. Wiley Taylor started his professional baseball career in 1910 with the minor league Ellsworth team of the Central Kansas League. He had trial outings with the Detroit Tigers and the Chicago White Sox, but most of his major league games (21 of 27) were with the St. Louis Browns, where he played in 1913-14. Taylor's major league record was 2-10, with an ERA of 4.10. After his baseball career, he remained in Pottawatomie County, where he farmed and served four terms as the county sheriff (1925-28 and 1945-48). Late in life, he also ran a service station and a recreation parlor in Westmoreland. Wiley Taylor died at the age of 65 in 1954. Earl Hamilton was born in Illinois in 1891, but moved with his family to Kansas as a youth and lived in Oswego during much of his major league career. He pitched in the majors for 14 seasons, from 1911 to 1924, mostly with the St. Louis Browns and the Pittsburgh Pirates. Hamilton's major league record was 115-147, with an ERA of 3.16. His achievements included a no-hitter against the Detroit Tigers in 1912. After his pitching career, Hamilton was active as a minor league team owner; he owned the Topeka Owls in 1942. Earl Hamilton died in California in 1968.